The Kazakhstan national football team is a fairly mobile team that can cause trouble to any opponent. 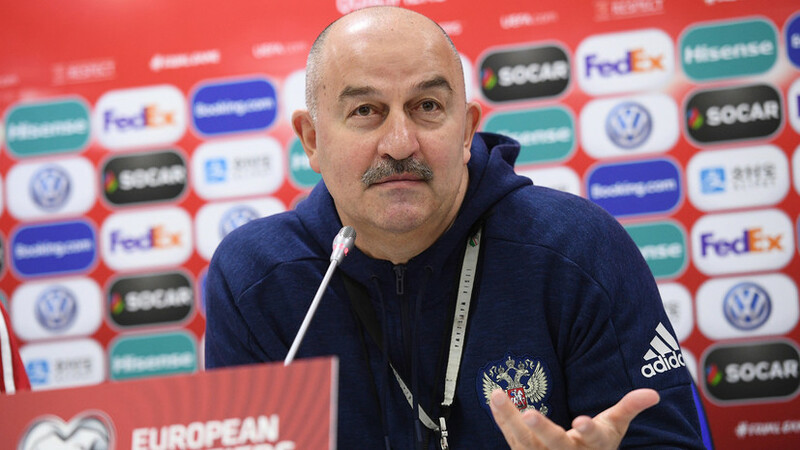 This was stated by the coach of the Russian team Stanislav Cherchesov on the eve of the match of the qualifying stage of Euro 2020. The mentor also commented on the removal of Alexander Golovin during a meeting with Belgium, as well as the game of Ilzat Akhmetov and Fyodor Chalov, who made their debut in the national team. The Russian team arrived in Kazakhstan on Friday evening, and on Saturday unexpected news was waiting for the domestic team. On Saturday morning, the capital Astana was officially renamed Nur-Sultan in honor of the long-term leader of the country Nursultan Nazarbayev who left his post. The corresponding decree was signed by the new president of Kazakhstan, Kasym-Zhomart Tokayev. Thus, the players of Stanislav Cherchesov will play in Nur-Sultan. True, according to media reports, the renaming of the city will not affect the Astana Arena, which will accept the game. On Saturday morning, the artificial turf of the stadium was first tested by the defender George Jikia, who arrived at the press conference together with Cherchesov, and then the other players of the national team. In this case, the defender of “Spartacus” was popular with local football fans and on the way to the arena managed to give out a lot of autographs, as well as the coach. And for Marinato Guilherme, a group of children even prepared a personal banner with a request to donate gloves. It should also be noted that in the run-up to an important match, the team trained in full force, including Lokomotiv midfielder Dmitry Barinov, who was on the team in the morning, entered the field. At the press conference itself, Cherchesov eagerly answered journalists' questions about the opponent and, as usual, joked a lot, sometimes teasing even over Djikia sitting next to him. - Kazakhstan in the first qualifying match unexpectedly defeated Scotland. Did this result surprise you? - We know that the national team of Kazakhstan is strong enough. The team includes people who love and want to play. We also know that the national team has a new coach, Mikhail Bilek. By the way, we met with him and played against each other. The match with the Scots has developed successfully, the more managed to score two goals by the tenth minute. So while some are criticized, others are praised. We will try to show the maximum, so that tomorrow we will be comfortable playing with this rival. - Dziuba does not score for 15 matches in all tournaments. Talked to him about this? - Why did you decide in the match with Belgium to entrust a place on the last frontier to the naturalized Brazilian Marinato Guilherme? - Gilya feels absolutely comfortable in the national team and speaks Russian a little better than I do in Kazakh. Therefore, he is in the team, and in this regard we do not feel any discomfort. At this point, Jikia entered the conversation: "It is clear that there was too little time to get to know each other and get used to it, but in general there were no problems." “By the way, I am an Ossetian, and a Georgian is sitting next to me. Therefore, I would not like to discuss this topic, yet we live in the XXI century. Moreover, Kazakh German Alexander Merkel plays for the national team of Kazakhstan. This is a normal practice all over the world, ”Cherchesov continued. “I am Russian, Stanislav Salamovich,” Jikia joked. - Does the Russian national team feel more comfortable playing with rivals who are betting on a pure forward, or with teams using the “false nine”? - It is easier for us to play with teams that are below our class, and according to which scheme they act, it does not matter. Probably, this will be answered by any trainer. But before each game, we clearly designate everything for the defenders, we try to explain to the maximum. - How do you feel about the fact that the Russian national team is criticized for its primitive style? - And who criticizes us? Sports journalists from Kazakhstan? We have players of a certain quality, we must adapt to them. By the way, Kazakhstan also plays long passes. We will do our best to make it comfortable to play with this particular opponent. - Whom do you most fear in the national team of Kazakhstan? - This is the case when the first game is difficult to select someone personally. It cannot be said that without one of the footballers, Kazakhstan will fall out. In this team, everyone knows their maneuver both in defense and in attack. It is necessary to carefully study the team, but I do not want to offend anyone. - Do you agree that the match with Kazakhstan is the most important for the Russian team after the World Cup, because you cannot lose points in it? - I agree that you can not lose, but Belgium could not give way. We wanted to win in Brussels and were well prepared for the game. But the outcomes of matches sometimes solve the nuances, the opponent created problems for us, and it did not work out to score points. As for tomorrow's game, we follow the standings, we can count. Our task is to achieve success everywhere. Tomorrow this is necessary. After the lesions need to rehabilitate. - Who will replace Alexander Golovin, who received the red card in Belgium? - Who will play instead, until I say. After the game, we did not communicate, but talked the next day in a relaxed atmosphere. Golovin himself realizes that he has done stupid things. No pumping was not, but it's time to grow up. He is a football player of a certain level and performs a significant non-standard role in the team. Such players, of course, are needed on the field, but Sasha will not. - Wouldn't an artificial Astana-Arena field become a problem for the Russian team? - The question is correct, but we have no choice. Clearly, it is better to play in the natural field, and I think the players of the Kazakhstan national team will agree with me. But now I came out on the edge, and it seems to be a fairly good quality coating. Jikia in Perm played enough on artificial turf in due time. In the end, it all depends on the preparation and mood for the match. - Ilzat Akhmetov and Fyodor Chalov made their debut in the Russian team in Belgium. Are you satisfied with their game? - Probably, it would not be entirely correct to evaluate Fyodor's actions, since he spent little time on the field. We exchanged views with him, it is clear that this is a slightly different level, and it is difficult to enter such games. Everything has its time. We are trying to do the maximum so that the same Anton Miranchuk gets a chance more often, since he plays a prominent role in Lokomotiv this season. When no matter how he now help the team. In general, you need to be more careful with young people, so that after each appearance on the field they get a positive, not a negative. - What do you think, what result can the national team of Kazakhstan show in the qualifying stage of Euro 2020? - I did not watch all the games, but I saw the League of Nations matches and, of course, I met with Scotland. At the same time in the new year, the team has changed the head coach. The national team of Kazakhstan is a fairly mobile team that can cause trouble to any opponent. And to make a long-term forecast is difficult for me. Jikia answered a couple of questions from journalists. In particular, he noted that the team has already moved away from defeat in Belgium. - Yesterday we flew all day, today we will study the opponent. We already know something, we have a certain idea about the national team of Kazakhstan, but today we will get the necessary information for a particular game. - There are enough injured people in the Russian team. Can we say that the team has problems? - Like Stanislav Salamovich, I do not like this word. Yes, there are losses, but we have someone to replace the guys. - How comfortable was it in Brussels to act in the middle of the three central defenders? - This position is familiar to me, and did not feel any discomfort. With the guys, too, slowly begin to play. It is clear that little time has passed, but in general there are no problems.